It’s time to plunder the enemy’s camp! But what does that mean? This is a strategic time of transition and within it is an anointing to take back what was stolen. We all recognize that the earth is groaning and a time of transition is upon us. I love Anita Alexander’s word recently about transition “A Season of Transition and Giving Birth”. That is exactly where we are. The birth pains we feel and which are occurring in both nature and the spiritual realm are all around us. We are in the stage of transition that requires that last great effort and push to see the birth of the dream, vision or new season. But in order to make that transition we have to shift from our current position to our new destination. That is the uncomfortable part. We have to take a leap and move. We cannot stay where we are at. a: the passage from one state, stage, subject, or place to another :change. As I prayed this morning I asked the Lord, “How do we get there?” I know there are many, like me, that are seeking His face to walk in His timing and walk into our prophetic destiny in this new season. We don’t want to miss what He is doing, but transition is HARD isn’t it? And many have grown weary and given up hope. Historically, whenever there has been a time of transition, there has been an opportunity and anointing to take the plunder. Plunder is that which has been stolen and which someone else now holds. But it is actually a provision to pay for the transition. So how do we do that? 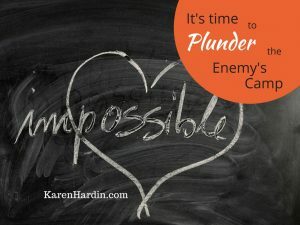 How do we plunder the enemy’s camp and take back what satan has stolen? I don’t know about you, but I have plenty of areas where there has been theft through my family lineage. As I prayed and studied the answer became clear and I had to laugh as I turned to the Jewish calendar. For we are in the very month of transition—the month of Elul as we transition from 5777 to 5778 and in this month is the anointing to take back! The time and season of an anointing to take back what has been stolen is available in this place of transition to plunder the enemy’s camp. Let me show that from the Jewish calendar. In the civil Jewish calendar, this is the final month before the New Year. By definition that makes it a month of transition from one year to the next. In addition, Elul is often connected to the tribe of Gad. Gad is the warrior tribe. It was within this tribe that there was anointing to go in and take back. The prophetic word Jacob spoke over his son, Gad, was “Gad shall be attacked by raiding bands, but he shall raid at their heels” (Isaiah 49: 19). Prophetically within the DNA of Gad was the turn around to take back what had been stolen. That is the month was are currently in. This is our prophetic destiny in this month during transition. No longer shall you be plundered. Instead it is time to go in to raid and plunder (take by force) from the enemy’s camp. To take back what he has stolen from you AND MORE. It is time to plunder the enemy’s camp! We can see through history that transition creates the opportunity for plunder. Within transition there are challenges, but when we recognize that challenges, in God’s world are simply opportunities, we can see them with His eyes rather than our own. 1. When Esther was transitioned into the kingdom as queen and the Jewish people were about to be transitioned to a place of honor and blessing there was hardship during the transition. The ruling that was meant to exterminate the Jews, turned into a time in which they plundered the enemy’s camp and they were moved into a position of honor. 2. David had been in transition a loooong time. He had to be weary. And then on top of that he and his men came back from a battle in which they were helping someone else and discovered that their camp had been looted and everything stolen. But in that place, Ziklag, it became the place of provision as they went back to plunder the enemy’s camp. They came back with so much plunder in fact, so much more than what was taken from them, that they shared it with other tribes and leaders. It became provision not only for their need, but it met the needs of others (I Samuel 29 & 30). 3. Abraham was in transition, walking out his destiny to discover the place God had for him. During that time his nephew Lot and all he possessed was taken into captivity. For Abraham, it was just as if they had plundered his own camp. He went to rescue Lot and as he and his army did, they plundered the enemy’s camp (Genesis 14). This was a strategic time as well in transition for Abraham. He chose not to take the excess plunder, but only what had been taken from them. This was a test in its own right…and God did make Abraham rich after that as the riches didn’t own Abram. Instead, Abram made sure that God would receive the glory. 4. As Moses and the Israelites left Egypt they were obviously in transition from one season to the next—from slavery to freedom. As they left Egypt, they plundered the enemy’s camp as the Egyptians handed over their wealth. The Israelites were receiving payment—with interest—for the years in which they had labored and had not been paid. In each case these individuals didn’t start the fight, but they were willing to go in and with God’s help finish the fight. And in each case God received the glory. This time of transition is a place of provision and a place of God’s glory—when we make sure that He receives the glory. That is a key element to this season as well. God always sees and He restores. He sees where there has been injustice and theft and makes provision for restitution. “For we know Him who said, ‘Vengeance is Mine,’ says the Lord, ‘I will repay.’ And again He says, ‘The Lord will judge His people’” (Hebrews 10:30). The word “vengeance” in that verse is the word, ekdikesis, which means to execute justice and what is right. To avenge. To make penal satisfaction or retribution. God is going to repay you for what has been taken or stolen. Repayment with interest. That is what it means by “plundering the enemy’s camp.” He isn’t going to just restore what was taken. No what He said was He was going to restore with interest, which is taking back EVERYTHING…PLUS. It’s time to plunder the enemy’s camp! We are in the place of transition this month for the warrior (GAD) within you to rise up and take back to provide for your next season. In the end the tribe of Gad did fulfill their destiny and received a blessing where Moses said, “Blessed is he who enlarges Gad’s domain! He lives there like a lion, tearing at arm or head. He chose the best land for himself; the leader’s portion was kept for him. When the heads of the people assembled, he carried out the Lord’s righteous will, and his judgments concerning Israel” (Deuteronomy 33:20-21). Gad was anointed to conquer and take the land. And as the Israelites fought to take hold of the Promise Land, it was Gad that not only took their portion, but said, “We will not return to our homes until every Israelite has received his inheritance” (Numbers 32:18). That is the blessing and empowerment that is available to us right now. Not only can we take back what has been stolen from us, but in doing so receive so much plunder that we are able to help other’s receive their Promise Land and a blessing. What has the enemy stolen from you? What has been stolen from your family? In times of transition, in that final push for the next season, there is an anointing to plunder the enemy’s camp and take back what has been stolen. You are looking for provision for this transition? It is already yours, you just have to take it back. If you would like to receive a list of scriptural prayer declarations to plunder the enemy’s camp and take back your inheritance email me here.